This month’s shop the look is for those who want to jazz up their office space before fall hits. 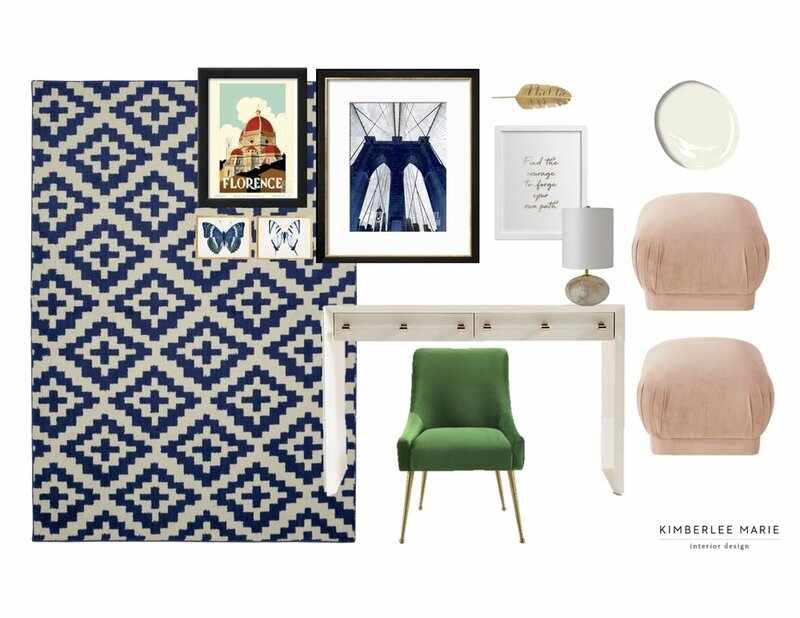 The eclectic modern office is affordable, fun, and will help keep you hustling! Featured in this space is a cozy emerald green velvet chair paired with a bold geometric rug. The low pile and machine made nature of the rug is perfect for a busy office space. A modern desk made of white lacquer and clean lines helps ground the loud color and pattern of the rug and chair. Adorning the desk is a beautiful semi-precious stone table lamp with caramel and gray veining running through it. It’s an elegant statement for your sophisticated space. Two blush ottomans provide additional seating for any visitors, clients, or pets keeping you company. Giving a little pizazz to the neutral walls is a collage of art meant to hang on the wall behind your desk. If your current space already has built-in shelves or something else occupying the wall behind your desk, this collage can easily be relocated to a wall in your office that needs a little more love. The thought behind these pieces is it tells the story of your travels, your hobbies, a little quote for motivation, and a dash of gold for more interest. You can revise this collage and choose different art pieces that tell your story or if you like the way the pieces fit together keep it the way it is! Your art should reflect you and what you enjoy. Happy decorating!